Your energy savings can pay for your lighting retrofit project. A lighting retrofit is the practice of replacing components in the system with counterparts that make it use energy more efficiently. 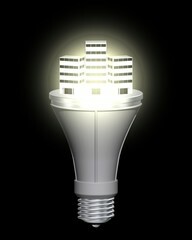 A lighting upgrade is any strategy that reduces the system’s energy use. Energy savings are realized over time that can be significant enough to not only pay for the new equipment, but produce a return on investment.